Taking issue with “hardline” Ambedkarites who have been strongly critical of Gandhiji, top expert and documentary film-maker for 40 long years, Anand Patwardhan has revealed that India’s undisputed Dalit icon Baba Ambedkar in 1932 not only highly praised Gandhiji but called him “Mahatma”. Pointing out that this is contrary to the popular belief, Patwardhan, who made a highly acclaimed film on various aspects of the lives and politics of Dalit people in Mumbai, “Jai Bhim Comrade” (2011), says in an interview, Ambedkar referred to Gandhi as “Mahatma” for offering “a much better deal for Dalits in terms of reserved seats than Ambedkar himself had asked or hoped for”. 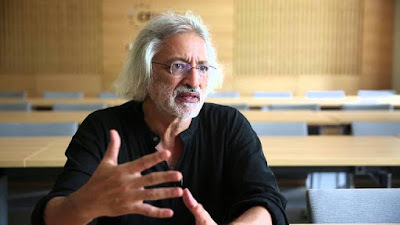 Other notable films by Anand Patwardhan, a secular rationalist and is a vocal critic of Hindutva ideology. include “Bombay: Our City” (Hamara Shahar) (1985), “In Memory of Friends” (1990), “In the Name of God” (Ram ke Nam) (1992), “Father, Son, and Holy War” (1995), “A Narmada Diary (1995), and “War and Peace” (2002), which have won national and international awards. Calling Gandhiji “inventive anti-Imperialist”, Patwardhan says, he was also “an organic naturalist that today’s madly consumerist, globally warmed world desperately needs”, and which, he adds, today’s Gandhians “not”.